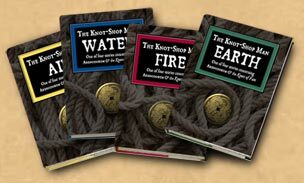 The Knot-Shop Man is a set of four books, each describing one child's journey to tie a knot of fate. Written for smart children or thoughtful adults, it's a story-knot of adventures told with the lyricism of a folk song and the matter-of-factness of a book of knots. Like all good folk stories or fairy tales, things are simple on the surface but, if you scratch deeper, complexity bleeds through. The Knot-Shop Man was published to celebrate the tenth anniversary, on 09/09/09, of our flagship project Planetarium, which has been bewildering and enthralling readers on this website, for free and without advertising, for almost two decades. It’s a limited edition of sets of the four books — signed and numbered and, naturally, knotted together. The project has been funded by the profits from Fudebakudo, the martial arts parody book that we have been selling since 2003. Early on, we had the choice of producing a run of The Knot-Shop Man on a commercial scale, like we did with Fudebakudo, or else producing a limited edition that could be really beautiful. Obviously, we went for the latter: making the set as four casebound books more or less quadruples the production cost; and over half a mile of rope doesn’t come for free, either. But people who love books will understand: the project needed to be four books, so you really can read them in any order, and so they can be properly bound together by a knot. You have to read the stories to fully understand why this is important. Big publishers can’t make books like this. But small, independent publishers can. We can obsess on the quality of what we are producing, rather than worrying about the marketing. In fact, we’ve done next to no publicity — besides, there’s no point us advertising a project like this on a commercial basis when we’re selling it pretty much at cost (we can't discount for the wholesalers such as Amazon like we do for Fudebakudo, for example). So, instead, we regard it as an art project (Planetarium, after all, is completely free) and as a treasure that people (most probably Planetarium readers, but possibly not) might stumble upon. If you’re reading this, you’ve discovered it. We hope you like what you’ve found here. By all means spread the word. This is the one you haven’t heard of (unless I commented on your blog about it). It’s a self-published quartet of fairy tales about a city where you can go to tie down your fate — to a person, to a goal. Is this a good idea? The answer is ambiguous, as four different people undertake four journeys, each under the tutelage of the proprietor of a shop that sells knots. (Not rope, mind you.) The stories vary from a sort of tragedy to a sort of triumph, and how you take the whole will depend on what order you read them in — the books quite overtly leave this up to you. It’s an interesting experiment, but the experiment is less important than the author’s deft, wry, and eminently readable narration. Ordering this will cost you some cash (shipping costs to the US particularly bite) but I recommend it anyhow. Get together with three friends and you can all read it at the same time. If you're interested in owning a copy of this remarkable, unusual, and rare Beholder project, please consider buying a set.